Nine University of Notre Dame graduate students will compete for prize money and a bid to the regional championships during the Three Minute Thesis competition on Wednesday (March 16). Known as 3MT, the competition features graduate students across all disciplines explaining their research in clear and succinct language appropriate for an audience of specialists and non-specialists alike, all within three minutes. 3MT competitors address a live audience and panel of judges with a single static slide accompanying their presentations. 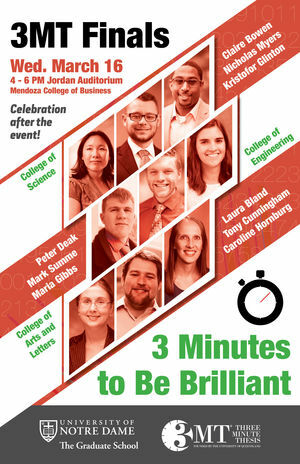 The students are vying for monetary prizes, and the Notre Dame winner will claim a spot in the Midwestern Association of Graduate Schools 3MT regional competition in Chicago on April 8. Advancing to the finals from the College of Science are Ph.D. candidates Claire Bowen, from the applied and computational mathematics and statistics program; Kristofor Glinton from biochemistry; and Nicholas Myers of chemistry. From the College of Engineering, Ph.D. candidates Mark Summe of chemical and biomolecular engineering, Peter Deak from chemical and biomolecular engineering, and Maria Gibbs of civil and environmental engineering and earth sciences advanced from the preliminary round. The three finalists from the College of Arts and Letters are Ph.D. candidates Tony Cunningham and Caroline Hornburg from psychology, and Laura Bland from the history and philosophy of science program. Carlson will be judging the competition along with City of South Bend Mayor Pete Buttigieg, South Bend Brew Werks co-founder and owner Drew Elegante and Trustee of South Bend Community School Corporation Maritza Robles. Notre Dame Vice President of University Relations Lou Nanni will serve as master of ceremonies for the finals competition. First- and second-place winners will be chosen by the judges, and those in attendance will vote for the “People’s Choice” winner. 3MT was developed in 2008 by the University of Queensland in Australia. Since then, the competition has grown to be held in 19 countries and at more than 35 research universities in the United States. 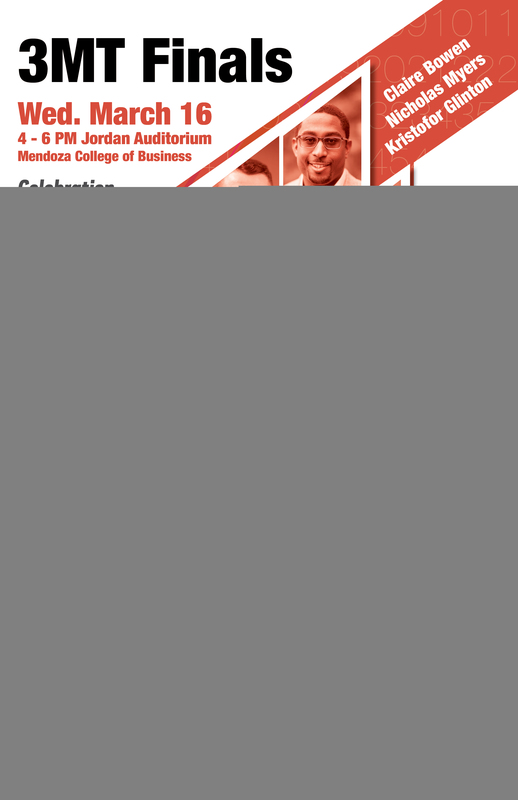 Notre Dame’s 3MT finals will take place from 4 to 6 p.m. in the Jordan Auditorium in the Mendoza College of Business. A reception will follow the competition, featuring drinks by South Bend Brew Werks. The competition and reception are free and open to the public. Originally published by Sue Lister at news.nd.edu on March 11, 2016.